My name is Colleen Ducat. I am an advertising major at Texas State University. I love to travel and experience new things. This blog will be about the adventures I take. It's great to have you on my blog. Hope you enjoy! This post is brief overview of my entire blog and its stats. This blog was a fun assignment for school that kept my mind thinking. It helped me keep writing and creating new content. I will continue this blog even after this class. It is good way to get my self recognized and voice heard. Hopefully in time, my blog will grow and more people will read it. I will no doubt go on more adventures and post about them. I have found a few things to be helpful when using WordPress: a few good tools are the widgets. They allow people who read your blog to get another look at who the author is. They are not just a voice behind a screen, but a real person experiencing all these things. Promotions are another good tool. looking back now, I would have promoted it on more than just twitter to get a wider audience base. One tool I had trouble with was the comment option. I received a comment, but was not able to find it when I went back to me blog. There should be easier way to access any comments or communication readers seek. An inbox or notification center would be a good tool for blogs. It would help the author communicate with the readers better. If I could change my site, I would probably take a more focused approach to my topic about travel. Alaska and Canada are huge places. I would narrow it down to the top places I went, but for the sake of content, I just talked about the whole Alaska trip. I will definitely continue this blog, and it will help me keep my mind working, thinking and creating new material for people to view. This is a good networking and social tool for people and companies to find you. It allows people to hear your voice and read what you have to say. There is a lot of writing in advertising, and I think this blog would help in that field because it keeps the mind working. It also helps focus on relevant topics among young people. Advertising is all about new perspectives and engaging the minds of people around the world, and if I can do that through a small blog, then this was all worth it. Through out this process, I have noticed that the more popular blogs are those who post content on a regular basis. They use the statistical tools to their advantage. Knowing when to post and when not to. I have experimented through the writing process by posting at different time of the week to see which times are most popular. My most popular week was September 17-23. This is when I first started posting content, and my blog got noticed. I got a total of 62 views and 25 visitors. My most popular post was “Parental Guidance” which was posted on September 20, 2018. This post got a total of 15 views throughout the semester. I think this post was popular because it was the start of the whole topic. It was the most thought out and planned post. It may have something to do with the title as well. A well thought title can make all the difference. I was surprised by the decreasing numbers I was getting. I got a lot when I first started, but the number of views fell quickly as I posted more content. Maybe it wasn’t as strong of content as the first few posts, but the decrease in numbers surprised me. With the use of social media I found that some platforms are more useful than others. Twitter was a less useful tool, since I only had a few followers. I used Instagram throughout the semester and that seemed to be really useful. I used two tool of Instagram to promote my posts. I posted pictures of my blog and used the story option for a quick promotion. I started looking at other websites about promoting blog posts. Forbes posted a good article about different techniques you can use to promote your work and get a wider audience. So throughout this process I’ve learned that I need to focus more on my content, and promote to more people and platforms to reach a bigger audience base. 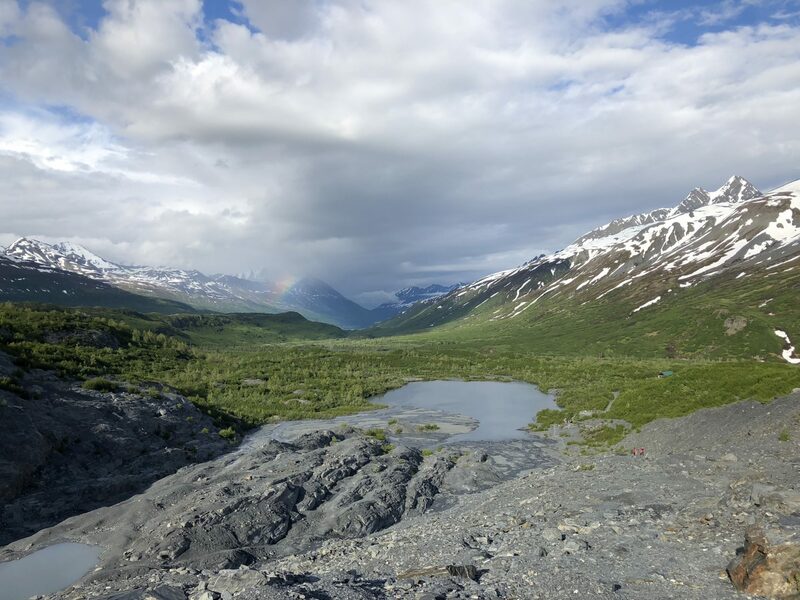 After our trek to the Arctic, we headed south to visit Denali National Park. Home to the tallest mountain in North America coming in at a height of 20,310 feet above sea level. This is an absolutely beautiful park filled with mountains, rivers, and wildlife in abundance. Even on an overcast and rainy day, this is a stunning expanse of land. So wild and natural that it seems untouched by man. The only way to enter the park is either on a bus tour or on a hike. During our visit to the park, my parents and I took a six-hour bus tour through half of the park. We did not get to go all the way to Denali; however, we saw so much beauty and wildlife that it was totally fine. Among the various animals were elk, moose, and doll sheep. No bears were seen, unfortunately, but most bears can be spotted along most of the roadways all over Alaska and Canada. You can Denali it all you want (see what I did there?) but this place is simply amazing, and a must-see stop on any Alaskan journey. After we left Denali National Park, we headed toward Wasilla, AK to meet up with some friends, but halfway there, my dad suddenly pulled into an overlook that was staring right at Denali. Unfortunately, the same cloud cover that we had during our visit to the park, was still covering the mountains. Geoffrey Chaucer was right when he said “patience is a virtue,” because if it wasn’t for my dad, and his ability to sit and wait for something to happen, we would have never seen even the smallest portion of Denali peaking through the clouds. It took about 5 hours to see just that small piece that we did. Even though we didn’t get to experience the full view of Denali, it gave us a reason to come back. We took two days in Wasilla, AK to visit friends and recuperate from the long drive. Our friends gave us many more suggestions on where to go on our way south. A little fun activity: if you visit Wasilla, make sure you stop in at the Iditarod Sled Dog Headquarters so you can cuddle with some adorable puppies. You can even go on a sled ride for about ten dollars. I suggest going in the morning when they open for maximum puppy time because it does get crowded. If you love dogs as much as I do, then this is a must stop destination. Hello dear readers, I would like to take a moment to tell you about another blog I love. If you like my work, then head over to this site for more content you’d love. If you love travel, and adventure there are many cool blogs out there to choose from; however, if you seek something more fulfilling and inspiring, then I am suggesting this amazing blog. You will love every word of it, and want to keep reading. I know I do. The blog, “we did our way” is written by Carine and Derek, two world travelers that live their life to the fullest. They promote living your best life, and that is ultimately my goal as well. These two have been to so many amazing places, and have so many stories to tell. We all have our own unique story. It’s just a matter of actually taking the steps necessary to achieve our goals. Carine and Derek inspire people to do just that. These two knew they wanted to see the world and explore. So they made the decision to put their home lives on hold and take an adventure. They chose to do what they want while they still can, so they dropped everything and are living their best life. Carine and Derek inspire and strive to make dreams to become reality. Go check them out for funny and inspiring content that will lift your spirits!